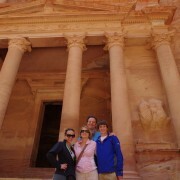 We had a fabulous two week trip to Israel and Petra in March 2010. Lauren was seventeen and Michael fourteen. We also traveled with my Mom and Dad who were in their late 60s early 70s. This was spring break of Lauren’s senior year so we knew we wanted to do something special. We were literally all over the map on where to go – India, African Safari, back to Europe. After looking quite a bit into India we switched gears and decided to do Israel, hoping that my parents might come on the trip with us. (India and Africa would have been out of the question for them). We havw traveled quite a bit over the past several years and always travel independently, hiring a guide here and there for certain sites, etc. This time, however, we decided to go with a private guide for most of the trip. 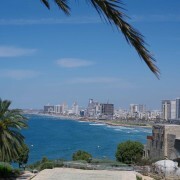 We did have a day on our own in Jerusalem, a free day in Eilat and two free days in Tel Aviv. A group tour was never an option for us (and after seeing so many while we were there, we now have even more reasons why!!) We just knew there would be so much to learn about while we were there and we figured a good guide was the best way to learn. I always planned our trips on my own using Fodors, TripAdvisor, etc. occasionally using a travel agent to book in-country flights like I did for Argentina. However, for this trip I did end up using a travel agent. We had to go during the kids’ Spring Break (we were lucky they had two weeks), but the last four days of the trip were going to be during Passover. Back in June/July when I started planning the trip I could not get the Israel hotels to give me pricing or anything for March. they kept saying to contact them after Rosh Hashanah which would not be until September. In the meantime, the flights were booking up and the flight I really wanted through Atlanta sold out. I always prefer to book my hotels before I book airfare (yes I am a planner!) and I started to get worried, so I decided to contact a friend of mine who is a travel agent in Virginia (I live in Oregon). She is someone that I actually met on the Fodors website. I knew that she liked to travel like me and did all her own trip planning, so I knew she would appreciate that I needed some help, but I would want to make the decisions on hotels, etc. on my own. 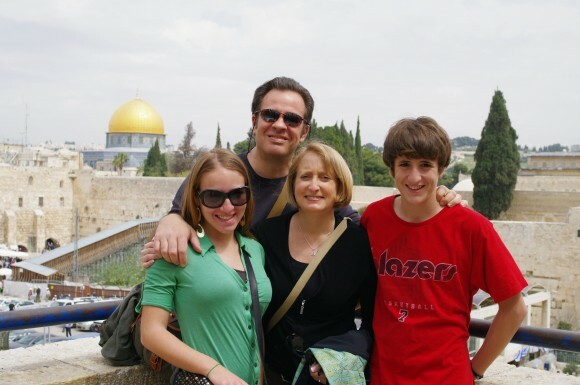 I remembered she had recently planned a trip to Israel for another family with teens. We were able to plan and organize everything via email and a few phone calls – it was excellent!! Through her contact in Israel she was able to book all the hotels I requested in July/August and got everything lined up for me including our incredible guide, Menachem (more on him later). It was great to have her help me and get everything confirmed so far in advance. 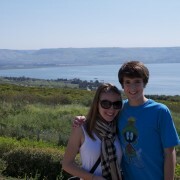 Plus her contact in Israel would check in periodically during our trip to make sure everything was okay. While we never had any issues or concerns, if we did, it was nice to know she was there to assist us. Our guide’s name was Menachem Holzman. He was the same guide the other family had used on their trip. I emailed the other family and they all spoke very highly of him, so I told Carol we wanted to request him. He and his wife are government licensed tour guides who also work independently– so you do not need to use a Travel Agent to book them. His email address is me.holzman@gmail.com. We all really loved Menachem and were so glad we had a guide. It was not just the things he took us to see, but the amazing conversations we had about politics, religion, Iran, Obama, Haredim, settlements, Muslims, history, the army, etc. etc. He is a secular Jew whose family has been in Israel since the late 1800s and he was willing to discuss all subjects. Our discussions became more profound as the trip went on. He owned a construction company and had worked with many Arabs and always wanted to show us that Jews and Arabs do get along. He took us to both Arab and Israeli villages and restaurants for lunch. Not to mention that he also has excellent taste in food!! All the places he took us and all his restaurant recommendations were excellent. Nof Ginossar (Galilee)– This is a large hotel located on a kibbutz, right on the Sea of Galilee so it was quite a nice setting. I believe there are three different types of rooms – we had the middle category – they were a bit more “motelly” then the higher type but in all honesty we were not in them that much so we were fine. There is a large dining hall that serves a very extensive and quite good dinner and breakfast (breakfast was included but dinner was extra). There really is no place that you can walk to from there so it was nice that they do have the dinner buffet. Our favorites at dinner were the gefilte fish, soup and the dark bread they served. They do cater to large tour groups, of which there were several while we were there, but the hotel is large and the grounds extensive so it was never a problem. They had a very nice gift shop –I hesitated to purchase anything there as it was our first stop, but in retrospect they had some of the nicest mezuzahs I saw. The second night we were there we had eaten a late and very large lunch so we were not super hungry for dinner, but did want a small bite. We knew the buffet would be too much ($$ and food) so we opted to eat in the bar downstairs. It was very busy, service was poor, and the food so-so though I am sure it was from the same kitchen as the buffet. All in all, with only two nights there we were happy with our stay. Harmony Hotel (Jerusalem) – This was our favorite hotel on the trip, which was good because we spent five nights there. It is a smaller boutique hotel VERY well located in Jerusalem within easy walking distance of the Old City, just a few blocks from tons of great restaurants, and about two blocks from Ben Yehuda Street. Also, the nice pedestrian street it is located on had some fun shops that got a lot of our shekels!! The four of us had the family room that was HUGE!! Each set of beds had its own flat panel screen and there was a lot of extra space for luggage, purchases, etc. My parents had a regular double room which of course was much smaller but they enjoyed it. The ladies at the front desk were very friendly and extremely helpful. It has a very bright breakfast room with a nice breakfast. The only slight negative was the cost of having laundry done (even more expensive than the laundry at the Royal Garden in Eilat) but there is a self-serve laundromat just half a block from the hotel so that is always an option. We were just so busy, never had time to do that. Isrotel Royal Beach (Eilat) – We originally booked three doubles at the Isrotel Agamin. A few months before the trip Isrotel contacted our travel agent to say they had a very large group book the entire hotel for a few days of our stay and they could put us in two triples at the Royal Beach at no additional cost. The Royal Beach is much nicer and more expensive – we still tried to argue for three doubles there, but if we insisted on the three doubles they would have put us up in a lesser one of their hotels. We decided to stick with the Royal Beach. When we arrived they even upgraded us to an ocean view with a jacuzzi. The rooms are quite large with a sofa bed in each for the kids, so the two triples were really not a problem. The bathrooms are also quite large – we really enjoyed all the space. Our first full day there was the Sabbath. The front desk was very helpful, but kept insisting that nothing would be open along the boardwalk until after sundown – we ventured out anyway, and were surprised when, I would guess, about 80% of the stores were open! It is well located on the promenade with a nice pool and beach area. The buffet breakfast was quite extensive with several things to choose from. But get down there early or you might have to wait in line (or maybe that was just because we were there the weekend before Passover). The only negative about the hotel was there were a lot of families with young children who would let their kids run around the hotel. We walked out of our room to be in the middle of a dodgeball game in the hall! Melody Hotel (Tel Aviv) – This hotel is also part of the Atlas Hotel chain that the Harmony is a part of. The front desk was nice and helpful, but the rooms are very small. We had three different doubles – some smaller than others. We were on the street side, but street noise does not really bother us. The problem was the bathroom. Our room had a shower stall (the two other rooms had a shower/tub). There was absolutely no way to avoid getting the entire floor flooded when you took a shower – luckily it was a small bathroom. If that was not annoying enough, they would only gave us two towels when they cleaned the room – when you clearly needed at least two additional towels just to mop up the floor. Every night I would call for two extra towels. They must know this is an issue and should at least provide extra towels without having to ask for them. The breakfast was similar to the Harmony but missing cereals and breads since it was Passover. The hotel is well located for the Promenade/beach, the Port and shopping on Dizengoff but a bit further for downtown. The rooftop terrace was fabulous with a great view and THE most comfy loungers!! Leann – Sorry I am so late in responding. For some reason I did not get the email notification that you had posted, and I just noticed it today. With the age of your kids, I think I might return to Eilat that night and your resort rental. Petra is a very big place and lots to see, but with the age of your kids I think they may get their fill at some point in the afternoon. Assuming the vacation rental will have more space/amenities than a hotel near Petra, I think I might head back to Eilat. Plus, this will make your trip to Jerusalem the next day that much quicker, and one less packing/unpacking the suitcases. Hope this is helpful!! Hi – Thanks for sharing your vacation details with us! I will be crossing the border from Jordan to Eilat and was wondering how long it takes to cross border? I have to catch a 10am bus from Eilat bus station and was thinking if it’s enough time if i get to the jordan border by 7:30am.